The Track passes by the Valley of the Giants Tree Top Walk, which gives you the chance to have an exciting birds-eye view over the canopy of the forest . Not far beyond Walpole, the trail passes Hilltop Lookout, before descending to the Frankland River, and then climbs to enter the Valley of the Giants. Here, it passes the award-winning Tree Top Walk, a 600m long walkway that rises almost 40 metres above the forest floor, offering a remarkable canopy-level view of the ancient tingle forest. Below, a boardwalk winds though a grove of veteran tingle trees known as the Ancient Empire. 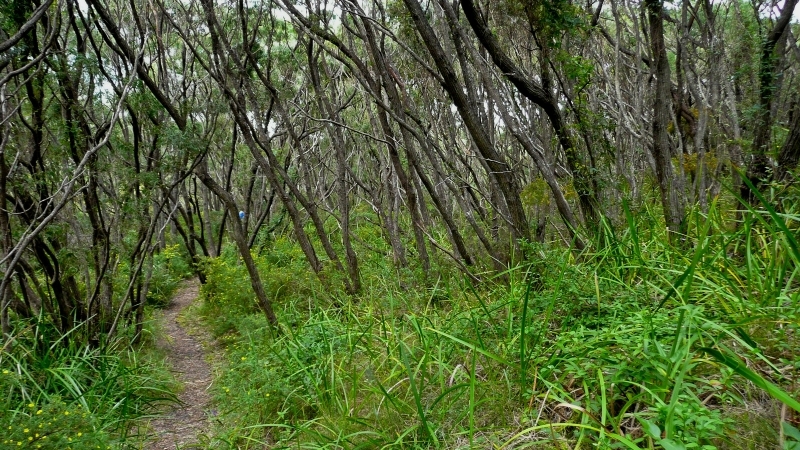 After passing through heathlands and low woodlands, dominated by the magnificent red flowering gum, the Track rejoins the coast at Conspicuous Beach and heads east again with a climb to Conspicuous Cliff, Rame Head and on to Peaceful Bay. This section provides the Track's greatest variety of scenery and vegetation. The Walpole and Nornalup Inlets are the sheltered estuaries of the Deep and Frankland Rivers. 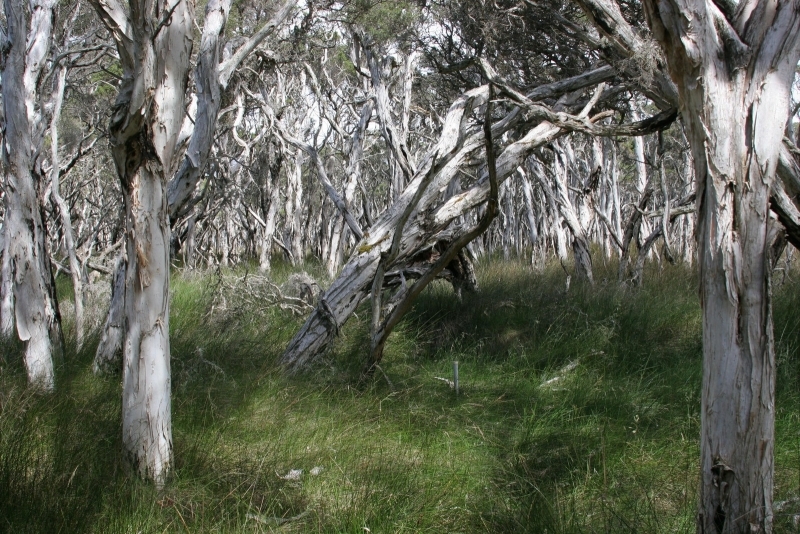 Discover wetlands of paperbarks, extensive wet coastal heathlands, catch a rare glimpse of dense karri forest adjacent to the sea. Beyond Peaceful bay and the canoe crossing on the Irwin Inlet are three very challenging days, each more than 20km. Canoes must be left on either side of Irwin Inlet to enable the next walker to get across. After the inlet crossing, the Track traverses the ‘Showgrounds’, an area of low open heath and grassland which is wholly out of character with the surrounding terrain. This area is home to many kangaroos and is particularly beautiful in the spring, when wild flowers bring a mass of colour. 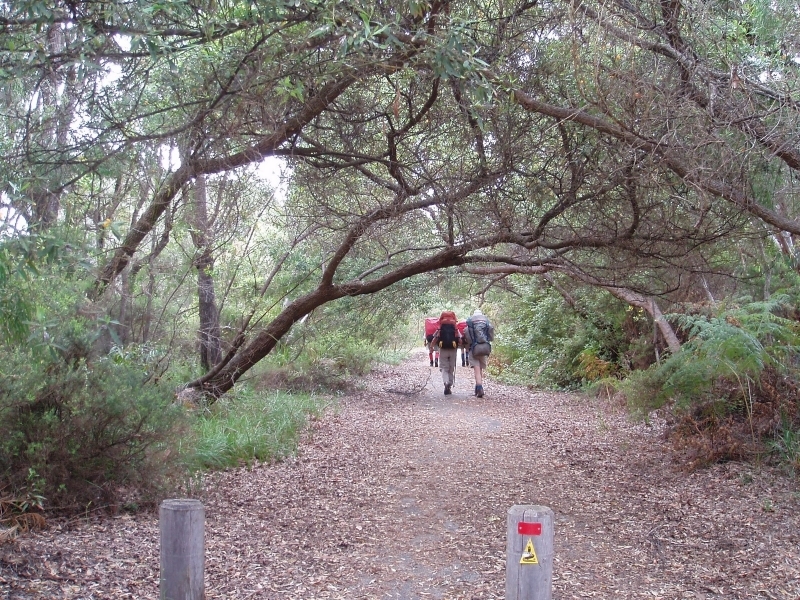 After the Showgrounds the Track leads over some steep ridges, along two stretches of beach and through sand dunes to the tranquillity of Boat Harbour campsite, from which a short stroll will enable you to take a well earned dip in the ocean. The ‘Showgrounds’ display a mass of colourful wildflowers in spring. Further east, the Track crosses the Parry Inlet. Here, there is a small, low-key camping ground, popular in summer, situated at the western end of Mazzoletti Beach. For many months of the year, the Inlet channel is easily traversed as the channel is completely blocked by a sand bar. When this is breached, the channel has to be waded. Find out more in the section by section guide. Walking along Mazzoletti Beach toward William Bay. As the Track approaches Denmark, walkers experience everything the south coast has to offer, from breath taking views along far reaching beaches to heathlands sheltered from the wild winds. The magnificent William Bay National Park, west of Denmark, offers tough beach walking, glorious rock pools and spectacular views from Tower Hill. On the ridges above Lights Beach, walkers are treated to visions of clear blue ocean water on one side and wildflowers blooming in the surrounding heathlands on the other. Not far beyond, the Track ascends to Monkey Rock and Mount Hallowell, providing further expansive outlooks over coast and hinterland. The area was first discovered in 1892 by Thomas Braidwood Wilson, an English explorer, while he was conducting an expedition from Frederickstown—later to become Albany. He named the river the Denmark River, after Dr Alexander Denmark RN, his friend and former tutor at Naval Medical College in England. Archaeological evidence tells us that Aborigines inhabited this area about 40,000 years ago. Fish traps in Wilson Inlet, and carbon from Aboriginal cooking fires in the sand from a cave near Ocean Beach have been discovered. Wilson noted that “the surrounding hills are of very fine soil and may be easily turned to good account” but Captain Thomas Bannister gave a more realistic account when he noted that it would require “great physical and moral courage” to farm the area. For more information on walking from Walpole to Denmark go to the Section by Section Guide.